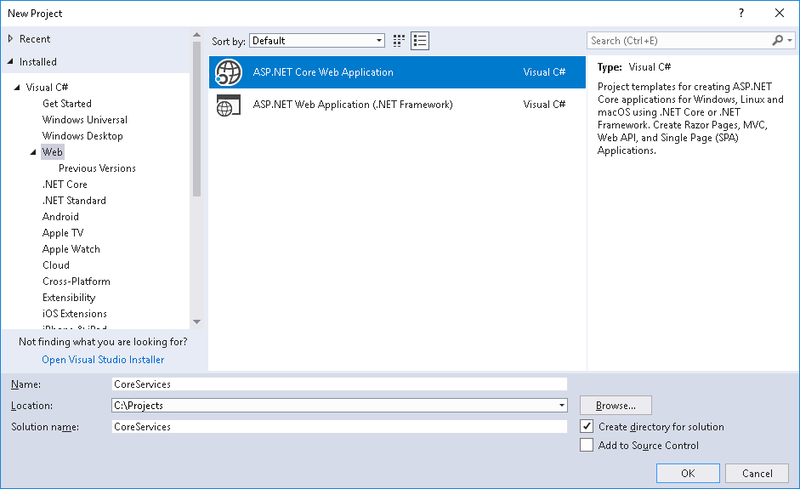 This article will explain how to perform CRUD (Create, Read, Update and Delete) operations in Asp.Net Core Web API using Entity Framework Core. We will see step by step instructions about CRUD operations in Asp.Net Core Web API. In this demonstration, we will use the Database First Approach where our database will be ready before creating an actual code. For more information about Asp.Net Core, its features and how to start with the first application in Asp.Net Core, you can refer above articles. These articles will give you a quick understanding of Asp.Net Core and you will be able to create the first application in Asp.Net Core able to publish it o IIS. Let's move to this demonstration and create CRUD operations. But before moving to the practical demonstration of CRUD operation in Asp.Net Core Web API. Let understand the objective of this demonstration which tells what exactly will be covered in this article. So, here is objective as follows. So, let's move to a practical demonstration of this article and see each step in more details. In this article, we will use a Blog related idea like Post and Category and see how to add new Post, update the existing Post, delete the Post after confirmation and finally show the available Posts as a list. First, we will open SQL Server Management Studio and create a database name as "BlogDB" along with two tables as "Category" and "Post". Category table will keep the information about the category of the blog post and Post table will actually keep the details about the post. So, you can create database and tables using the following SQL snippet code. Now, we have database and tables are ready. 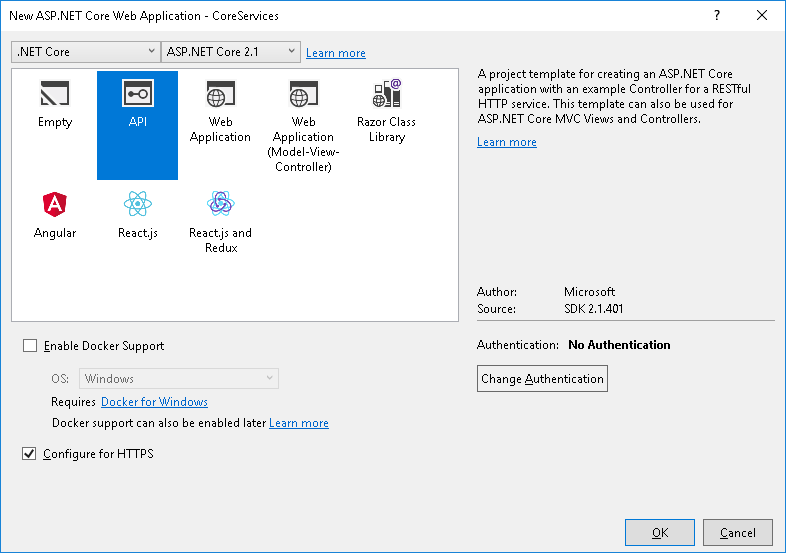 So, let's move to create Asp.Net Core Web API project, but be sure your development environment is ready for .Net Core application. You should require some of the prerequisites to start this demonstration with Visual Studio 2017. First, you should have installed .NET Core 2.0.0 or above SDK and second, you should have Installed the latest version of Visual Studio 2017 i.e VS 2017 15.7+ version. Once your environment is ready, you are good to go. We should follow below steps while creating new Asp.Net Core Web API. As we have selected 'Configure for HTTPS' while creating the project, it will ask to configure SSL for this project. To configure this click to YES. If we will do each step correctly, our project will be ready within a few seconds and it will look like as follows. 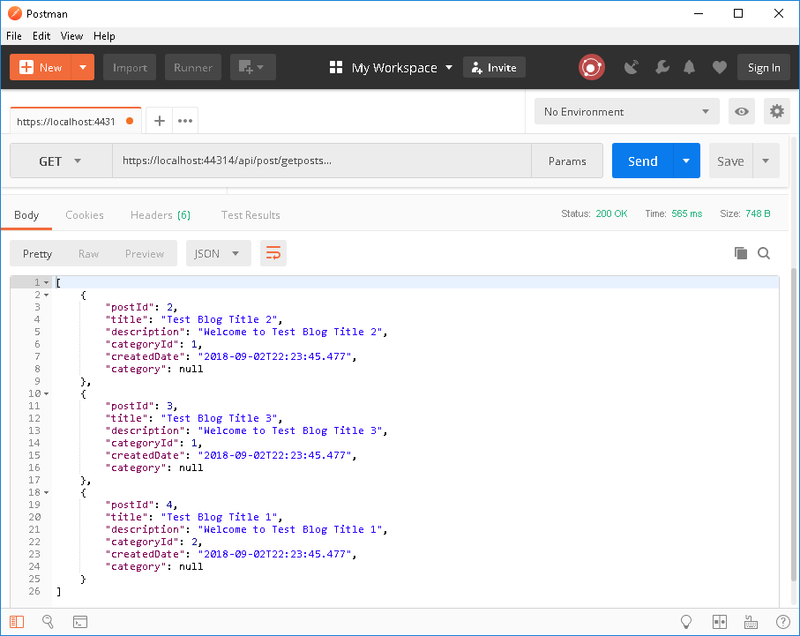 Here You can see the project structure with following images for the Asp.Net Core Web API. Although all the components are important for this application, mainly we should focus on Startup.cs, Appsettings.json, Dependencies and API Controller. As we have already known that we will use Entity Framework Core as ORM for this demonstration. To use EF Core, we have to install some of the packages which will provide classes to work with EF Core. We can install these packages either using Package Manager Console to execute a command to install specific package or directly search on NuGet Package Manager and install it. So, let install one by one required packages with this solution. So, right click to project and choose Manage NuGet Packages. It will open Nuget Packages Manager from where we can search any required Asp.Net Core package and install the specific version. First one is Microsoft.EntityFrameworkCore.SqlServer which will provide classes to connect with SQL Server for CRUD Operation to Entity Framework Core. Next one is Microsoft.EntityFrameworkCore.SqlServer.Design which will provide design-time core functionality to Entity Framework Core for SQL Server. And the last one is Microsoft.EntityFrameworkCore.Tools which will help to work with database related activity like add migration, script migration, get dbcontext, update database etc. As above we have installed all the required packages which are required to work with Entity Framework Core. So, generating Entity Framework Core Models Classes from the database As we have a database already exists; we should run the following command from the Package Manager Console. To open it, go to Tools > NuGet Package Manager > Package Manager Console and execute the following commands. With above command we have provided SQL Server details like server name, username and password to access that server and existing database which contains tables. Apart from this, we have given Output directory where Models classes should be generated. This above command creates three classes inside the Model folder as BlogDBContext which is nothing but DbContext class for application and other two classes are Model classes which are related to database's tables. Just for now comment the OnConfiguring() method of BlogDBContext class because later we will configure our Dependency Injection inside the Startup.cs class. //#warning To protect potentially sensitive information in your connection string, you should move it out of source code. See http://go.microsoft.com/fwlink/?LinkId=723263 for guidance on storing connection strings. This is a Category Model class which is auto-generated from the database. This is a Post Model class which is auto-generated from the database. As we have commented OnConfiguring() method of BlogDBContext and now going to create our mechanism to access database and perform CRUD operation on this. First, we will define our connection string inside the appsettings.json as follows. Now, let's create a Repository class as the middle layer of this API. So, just create a folder name with 'Repository' and create two files as the name with 'IPostRepository' and 'PostRepository. Just leave these interface and class as for now. We will implement CRUD implementation code with later. For now, just jump to Startup.cs class and add dependency injection for BlogDBContext class and PostRepository using following code. Whole code for the Startup.cs class is as follows. Now let's create a folder name with ViewModel and create one class as PostViewModel. This is nothing but a model class which is responsible for getting the data from multiple sources. As we have to show data together for category and related post. So, that's why we have created this PostViewModel. Now jump to actual CRUD implementation with the code. So, open IPostRepository and add required methods for the CRUD operations. So, we can see with following IPostRepository interface, we have defined different methods for the different purpose. GetCategories will get the list of available category, GetPosts will get the list of available post, GetPost will get the individual post for specific Post Id, AddPost will add new post detail, DeletePost will delete the individual post based of Post Id and last UpdatePost will update the existing post. As we are returning Task-specific data, it means, data will return asynchronously. Now, let's jump to PostRepository and implement IPostRepository. First, we will get the instance of the BlogDBContext using the Constructor Dependency Injection. Once, an instance will be available then we will move to further implementation. So, implement CRUD operations (Create the Post, Read the Post, Update the Post and Delete the Post) using the following codes. In this PostRepository class, we will interact with the database using Entity Framework Core and perform the CRUD operations. Now, we will do the actual implementation with the API controller to expose the END-POINT. So, first add a new API controller name as 'PostControler' to right click on Controler folder and choose Add > New Item. So, again we will get the instance of PostRepository using Constructor Dependency Injection and then first get the list of the category using the GetCategories() End Point, similarly we will define rest of the End Point for CRUD operations. Finally, we have done with the implementation of CRUD operations with Asp.Net Core Web API using Entity Framework Core and Repository. 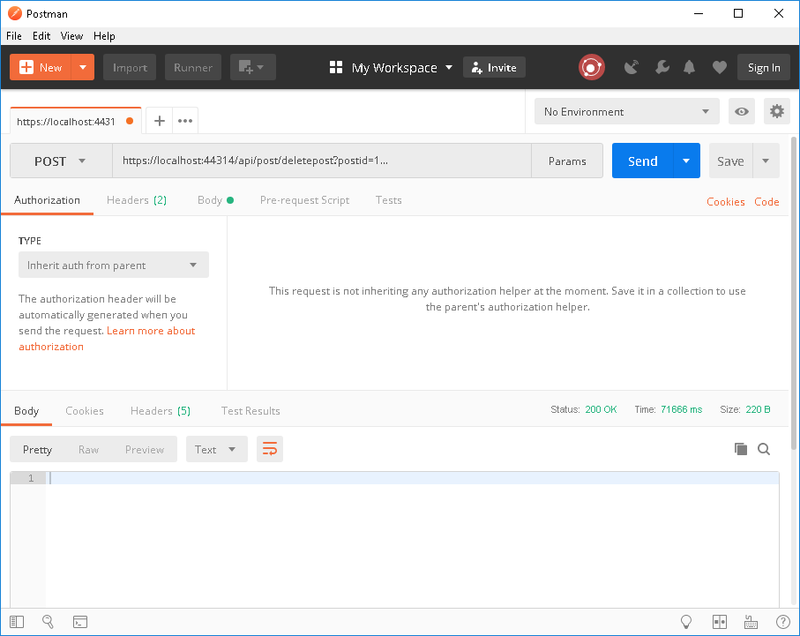 So, let move to Postman and test our API End Points. So, let's first test the GetCategories End Point as follows. Choose the Get as a method and pass the End Point inside the URL and define a header as 'Content-Type': 'application/json' and click to Send button. It will return the list of available category. Next test for adding new post using Postman, so, first choose the method as a POST and pass the addpost End Point, add a header similar to above for Content-Type and provide the post details which will add inside the RAW section. After setting this, click to SEND. It will add your record to the database. Next test for updating the existing post using Postman, so, first choose the method as a POST and pass the updatepost End Point, add a header similar to above for Content-Type and provide the post details which needs to be updated inside the RAW section. After setting this, click to SEND. It will update your existing record to the database. Next test for getting the list of available posts using Postman, so, first choose the method as a GET and pass the getposts End Point, add a header similar to above for Content-Type. After setting this, click to SEND. It will give you list of available post records from the database. Next test for getting the individual post using Postman, so, first choose the method as a GET and pass the getpost along with Post Id End Point, add a header similar to above for Content-Type. After setting this, click to SEND. It will give you individual post detail from the database. Next test for deleting the existing post using Postman, so, first choose the method as a POST and pass the deletepost End Point along with Post Id which needs to be deleted, add a header similar to above for Content-Type. After setting this, click to SEND. It will delete your existing record from the database. 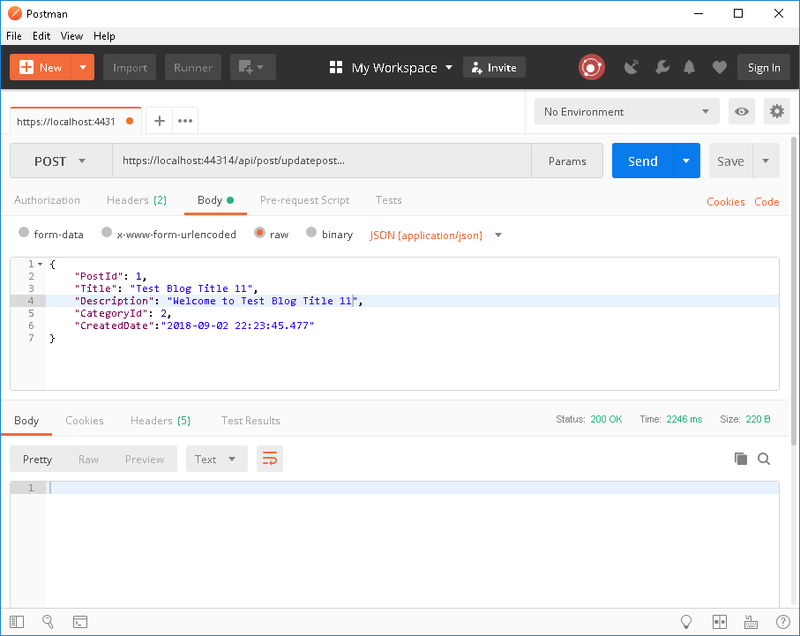 Wow... we have created an Asp.Net Core Web API and added Entity Framework Core and implement CRUD operations. At the end, we have also tested each End Point for the API and everything working fine. But one problem is persisting yet and that is CORS issue. If you will deploy this API somewhere and will use with some other application then it will throw some CORS related exceptions. So, let configure CORS also to make this API perfect. So, open Startup.cs and ConfigureService() method and add the following lines of code to create CORS policy. And then use this CORS policy inside the Configure method as follows. Following is the whole code for Starup.cs class along with CORS implementation. So, today we have learned how to perform CRUD operations with Asp.Net Core Web API using Entity Framework Core. 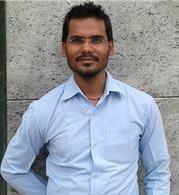 Nice post, with view model concept as well as Repository pattern without Generic repository, it will helpful.